Merck Animal Health just announced that Vetsulin (porcine insulin zinc suspension) will again be available for distribution in the USA this week (1). This is welcome news, especially for dogs with diabetes mellitus that are not well regulated with other available insulin preparations, such as human recombinant NPH. 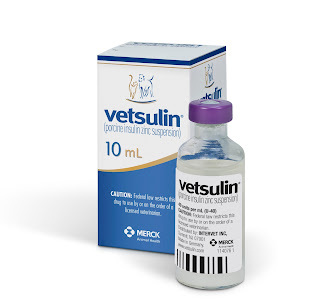 Most authorities consider Vetsulin, known as Caninsulin outside the USA (2), to be the initial insulin of choice for treatment of dogs with diabetes mellitus (3-6). It can also be used to successfully manage cats with diabetes (7,8), but we have many other good options for treatment of feline diabetes. As you may know, Vetsulin has had its share of problems in the last few years, which lead to the FDA having it withdrawn from the US market. All of these manufacturing issues have been resolved, and the FDA has re-approved the drug for release. How is the "new" Vetsulin different than the original insulin product? According to the company, the updated Vetsulin product has the same characteristics as the original insulin preparation, and the action in diabetic patients is expected to be the same as before. There have been no changes in the safety profile of Vetsulin for use in either dogs or cats. The only difference in the Vetsulin itself is a slight change in the listed proportion of the short-acting amorphous fraction and long-acting crystalline fraction. The short-acting amorphous fraction is now listed as 35% (it was 30%), whereas the long-acting crystalline fraction is now reported as 65% (it was 70%). Vetsulin will now be available only in 10-ml vials. The 2-5 ml vial formulation of Vetsulin has been discontinued. Prior to use, vials of Vetsulin should be shaken thoroughly (manually) until a homogeneous, uniformly, milky suspension is obtained. Foam on the surface of the suspension formed during shaking should be allowed to disperse before the product is used. Vetsulin contents should be used within 42 days after the vial is first punctured. For the first new vials of Vetsulin that are released, the initial product dating will be only 12 months from the manufactured date. The company expects that Vetsulin will eventually have a 24-month shelf-life. Additional information can be found on the Veterinary Home Page under the Product Update section (10). Also, see the package insert for full information regarding contraindications, warnings, and precautions (9). It's great to have Vetsulin, an FDA-approved insulin for use in both dogs and cats, back on the market. The company has done a great deal of work showing that Vetsulin is stable and effective, and they have made a few minor but good improvements in this insulin preparation. Vigorous manual shaking of the Vetsulin? How will that impact accurate dosing? We have all been taught that vigorous shaking will interfere with accurate dosing because of air bubbles that form when the insulin bottle is shaken (5,11). When the dose is drawn up, the insulin suspension may come out into the syringe together with lots of air bubbles. In addition, we tend to worry that too vigorous shaking may damage the insulin protein structure itself. For these reasons, we generally instruct owners to gently roll the insulin vial than to vigorously shake it! According to the company, the instructions are now to give the Vetsulin bottle a vigorous shake on initial use; then let it settle for a few minutes to let the bubbles rise before drawing up the dose. Upon subsequent insulin dosing, the bottle should only need a quick shake (less vigorous) to resuspend the insulin prior to drawing up the insulin dose. Why this difference in vigorous shaking vs. rolling? I don't know, but I suspect it has something to do with the way the study was designed and input from the FDA. 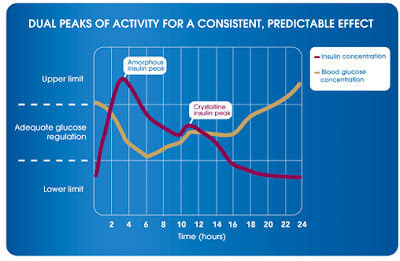 In any case, Merck Animal Health actually has done the studies to prove that this vigorous manual shaking does not interfere with the measured insulin concentration in the product (10). Why was the proportion in the short-and long-acting insulin fractions changed? According to the company, the proportions of the short-acting amorphous fraction and long-acting crystalline fraction have not actually changed, as compared to the original Vetsulin product. 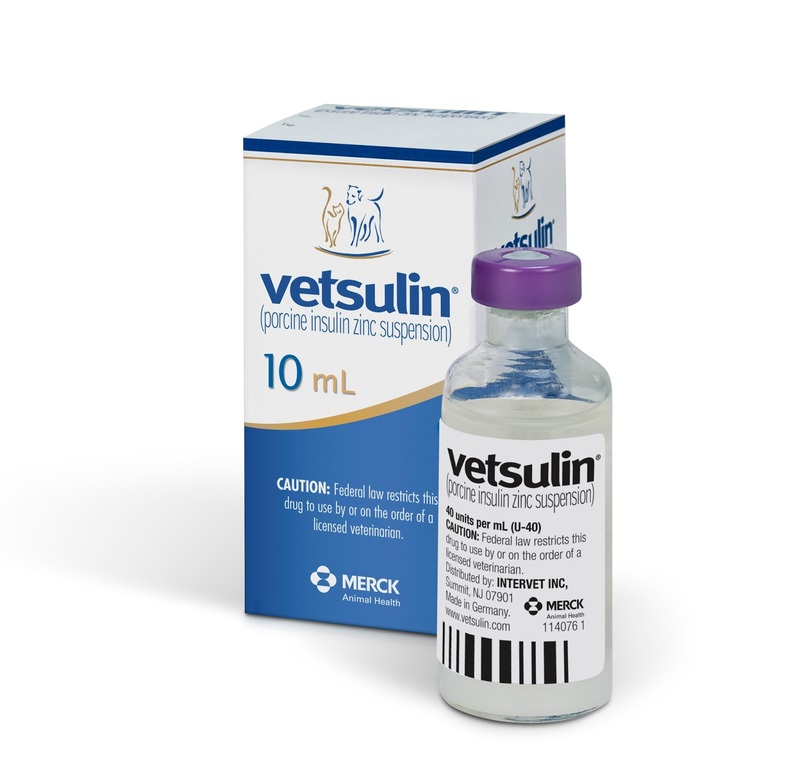 Instead, the new stated ratio (65% long-acting and 35% short-acting insulin) represents a more accurate reflection of the actual composition of both the original and updated Vetsulin product (10). Nevertheless, on a clinical basis, such a small change in the short- vs. the long-acting insulin fractions would not be expected to make any difference in the animal's glycemic control, even if the composition of the product did change slightly. Must Vetsulin really be discarded after only 42 days? The Vetsulin product insert (9) clearly states that the product should be used within "42 days of first vial puncture." Has the efficacy really been determined to decrease after 42 days? The answer to that is no — it's almost certain that the potency of this preparation will extend many days (or even weeks) longer than this 42 days. However, because Merck Animal Health only did the FDA studies for a period of 42 days, that's what they have been required to put on the package insert. But remember, in addition to efficacy, we must also worry about bacterial contamination secondary to repeated puncture of the insulin vial (11). Why such a short expiration date? Again, for the first new vials of Vetsulin that are released, the initial product dating will be only 12 months from the manufactured date. This is not because the updated Vetsulin is unstable, but the FDA requires ongoing studies of the insulin's duration. The company expects that Vetsulin will eventually have a 24-month shelf-life (10). Since we do not have to worry about Vetsulin disappearing again, at least anytime soon, I wouldn't recommend purchasing too many insulin vials now, since the initial "expiration" date will be only a few months. Monroe WE, Laxton D, Fallin EA, et al. Efficacy and safety of a purified porcine insulin zinc suspension for managing diabetes mellitus in dogs. J Vet Intern Med 2005;19:675-682. Fleeman LM, Rand JS, Morton JM. Pharmacokinetics and pharmacodynamics of porcine insulin zinc suspension in eight diabetic dogs. Vet Rec 2009;164:232-237. Nelson RW. Canine diabetes mellitus In: Ettinger SJ,Feldman EC, eds. Textbook of Veterinary Internal Medicine: Diseases of the Dog and Cat. Seventh Edition ed. St. Louis: Saunders Elsevier, 2010;1449-1474. Davison LJ. Canine diabetes mellitus In: Mooney CT, Peterson ME, eds. BSAVA Manual of Canine and Feline Endocrinology. Fourth ed. Quedgeley, Gloucester: British Small Animal Veterinary Association, 2012;116-132. Michiels L, Reusch CE, Boari A, et al. Treatment of 46 cats with porcine lente insulin—a prospective, multicentre study. J Feline Med Surg 2008;10:439-451. Martin GJ, Rand JS. Control of diabetes mellitus in cats with porcine insulin zinc suspension. Vet Rec 2007;161:88-94. American Diabetes Association. Insulin administration. Diabetes Care 2001;24:1984-1987. Would you mind please explaining why Vetsulin isn't best for controlling Diabetes in cats? Vetsulin will work fine to manage diabetes in cats. However, it may not have a duration of action that is long enough in some cats. Therefore, most veterinarians prefer using either glargine (Lantus), detemir (Levemir), or PZI (ProZinc), all longer-acting insulin preparations that work better in most cats. In this post, I did not say that Vetsulin will not control diabetes in cats — because it certainly will be reasonably successful in controlling hyperglycemia in many cats. However, if better diabetic control is the goal, especially if we want to get a cat into diabetic remission, then a longer-acting insulin preparation will generally work better.